ISDP Forum: Japan in the World - Toward a Larger Role? 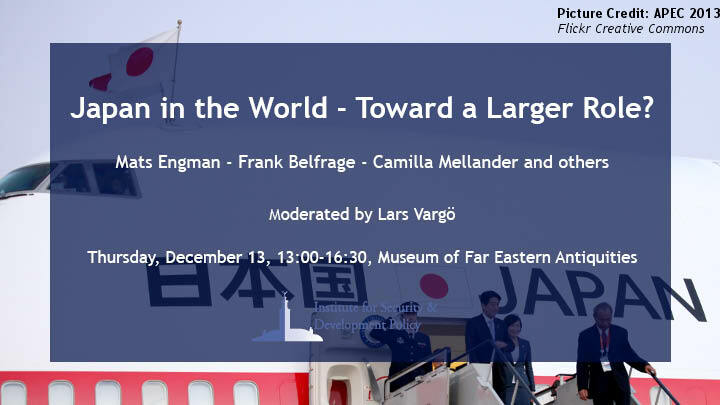 ISDP Forum: Japan in the World – Toward a Larger Role? Trade wars, nuclear crises, totalitarian regimes and an American president out for vengeance – the East Asian region is at the center of the contemporary debate on international security and the international free trade system. In this region sits Japan – a democratic, free-trading cornerstone in the U.S.-led international liberal order with what has been called a “peace constitution” limiting its ability to engage militarily. In two consecutive seminars, this ISDP Forum will explore whether Japan needs to change to stand up to challenges from countries like China and North Korea, and in order to defend the international free trade system. An agenda follows below. After the respective panels there will be time for Q&A.The forum will be moderated by Dr Lars Vargö, Distinguished Fellow at ISDP.